The scenario objective. The initial assault was easily rebuked. Ben and Urbain had a go at the rules, version 0.51 or thereabout, and we used more units than the usual 3 squads a side, with the German player fielding a mix of regular troops and FSJ, supported by some StuG and Panzers, including a Panther. 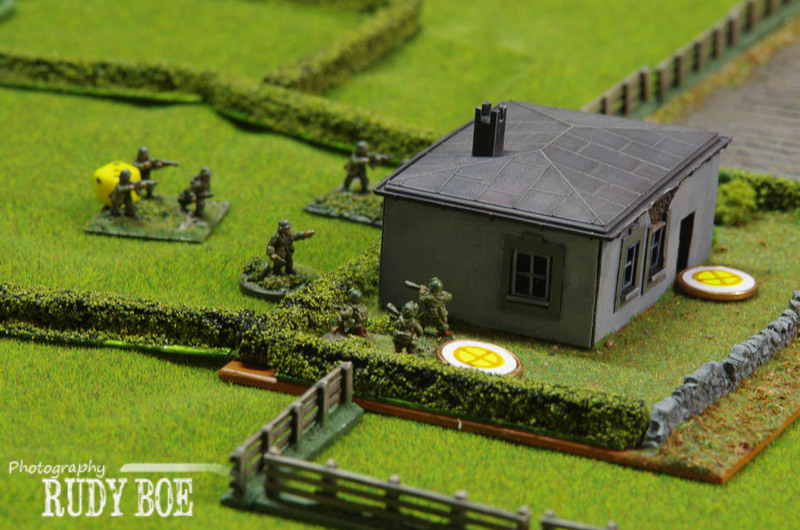 The US player had to defend this headquarter for 9 turns, and fielded 6 squads of Airborne, with LMG and 60 mm mortar support and 3 tanks in support. The battle did not last very long, with the German player giving up rather quickly due to what I considered limited losses during a full on charge without any smoke cover across a 100 m long field. The rules, on the other hand, held out all the way. There were quite a few constructive comments, and the dividing line between what the rules should cover and what they should not is becoming clearer: it's useless to talk about markers, bases and so on, these are things that depend on the players and their gear. Another thing that I have to start thinking more about is a first scenario pack. The rules in themselves are near finition, even if the manuscript is not. The manual remarks, corrections and improvements now need to make it into the v1.0 rulebook. However, for the rules to have playability, we need a scenario pack too. 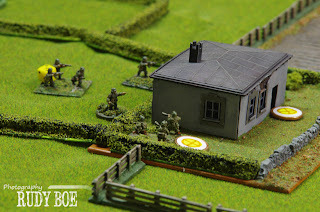 The first pack will definitely treat the 1944 Europe theater, with Normandy, Arnhem and Bastogne as the three turning points. We have already seen how much balancing a single scenario requires, so there will be a lot of playing in the near future. Another project that has to be tackled in parallel is the Build Your Scenario book, which lists armylists and rarity of equipment and will propose a method for building scenarios in any scenario.